“Hoka Hey! It is a good time to die! Chief Crazy Horse is known as the greatest warrior ever of the Oglala Sioux (Teton Lakota). He was born on Rapid Creek, Dakota Territory, about 1842. He died September 5, 1877 at Fort Robinson, Nebraska after being stabbed with a bayonet while struggling to keep from being placed inside a guard house when he thought he was going to a meeting with white leaders to correct a misunderstanding resulting from a deliberate misrepresentation of his words by an interpreter during an earlier conference. He was highly regarded by his people, jealously envied by some rival chiefs and would be leaders of the Lakota people and greatly feared by the soldiers. This combination of jealousy and fear led to his death. There are no authenticated photographs of Crazy Horse and he was known to resist having his photograph taken. Several years after his death, two or three images have been presented as being photographs of him. One that is documented by Carroll Friswold as having been taken at Fort Robinson at the urging of a friend (Little Bat) seems to me to be the most likely to be an actual photograph of Crazy Horse. 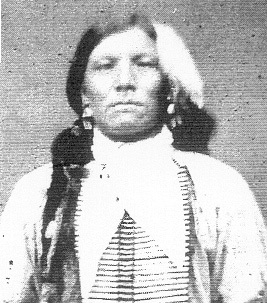 His appearance is described as: light skinned, long curly brown hair, not tall (about 5’8”), having sharp features, being more rounded of face with less pronounced cheek bones, with a scar on his left jaw near his mouth and nose from a bullet wound where No Water shot him for being with Black Buffalo Woman who had married No Water. He is said to have worn his hair long to his waist and while not in battle braided with beaver pelt covering and having two eagle feathers hanging down on the left of his face. In battle, he wore his hair loose with a single red-tailed hawk feather, a stone behind his ear, his face painted with a lightening bolt and hail stones, no shirt only a breech cloth and leggings. He tied a single red-tailed hawk feather to his horse’s tail, dusted his horse’s mane and tail and himself with dirt from a mole hill, wore a battle necklace with a special mixture of the brain and heart of an eagle mixed with dried wild aster seed in a small deerskin bag and blew an eagle bone whistle just before going into battle. These actions were taken and items worn as a result of his vision as a young boy. The vision of Crazy Horse as a boy would direct his every action for the rest of his life. After witnessing the first of many battles between the Lakota and the soldiers where Chief Conquering Bear and several soldiers were killed, he went off to himself for three days where he sought to understand what had happened and what place he would fill in the coming years. On the third day he saw a horse and rider emerge from a body of water and float in the air. The horseman was dressed in breechcloth with leggings only and one feather in his hair. His hair was unbraided. He wore no war paint. A voice spoke to Crazy Horse saying, “You are to help the people with what ever need they have. You are not to take anything for yourself. If you go to war, bullets and arrows will not harm you as long as you dress in plain clothes, wear your hear unbraided with only one feather on your head and carry a small stone behind your ear. Before you mount your horse you are to throw dust over yourself and your horse.” A crowd of people now appeared in the vision; they tried to hold the horseman back by grabbing onto his arms. He rode through the people and kept going. A thunderstorm appeared with hail and lightning all around, the horseman kept on riding. The storm faded, showing the horseman with hail spots on his body and a zigzag streak of lightning on his cheek. In the quiet after the storm, a red tail hawk appeared overhead, his scream echoing as he flew over the horseman. Now the people appeared again grabbing at the horseman’s arms, but he pulled away from them and rode off. (The above account of Crazy Horse’s vision is taken from Freedman, The Life and Death of Crazy Horse, pg 31-34 and repeated in Ehanamani, Crazy Horse, pg 7-8). He did not seek notoriety, rather avoided recognition and did not brag of his exploits. His first thoughts continually were to provide for the welfare of his people. Even as a young boy he gave away game he killed to others and just before his death his decision to bring in his people as the soldiers demanded likely was caused by the failure of the buffalo food supply rather than any fear of fighting. He never lost a battle, was never injured by a bullet (only an arrow when he once took two scalps and from that point on never again took scalps) and was forever the first person to charge the enemy, often running his horse close to the enemy line over and over again. His chosen weapon was a battle club. Crazy Horse was known as Curly when very young because of his long curly hair. He was given the name of his father (Crazy Horse) after having demonstrated his prowess in battle at an early age. He was fearless in battle, quiet and reserved in camp, kind to his people, always helping the needy and was chosen as a young man to be a shirt-wearer and chief. This event truly humbled Crazy Horse and he never ceased to think of the needs of his people but once and that one lapse caused the other rival chiefs to remove the shirt from him. They were looking for any opportunity to discredit him as he was so popular with the people. After No Water shot him in the face for being with his wife, Black Buffalo Woman, Crazy Horse’s ceremonial shirt was taken from him. Nevertheless he continued to be held in the highest regard by his followers, thus making the rival chiefs even more envious and jealous. He was forever seeking to fulfill his vision and help his people through hunting for food, leading in battle and was never boastful or proud. He was often quiet and removed from tribal activities and ceremonies. He frequently meditated and sought spiritual guidance. During one such search for wisdom, a far-reaching vision was provided to him whereby he saw the end of his people’s traditional ways, the weakness caused by alcohol and the resulting destruction of his people’s strength and character. He further saw the time when all people would come together again and seek the light of understanding. Between these two images however, he saw great trouble and much hardship for his people. So Crazy Horse had foreknowledge of the manner in which his people would come to depend too heavily on the white man’s handouts and loose their way even as he fought to preserve the old ways. This knowledge that his people could not win in the long run and the loss of the buffalo may well have contributed to his eventual decision to bring his people in when he did. Crazy Horse led the struggle against the overwhelming odds of the white soldiers. He continued to gain the respect of the people he led through courageous fighting and cunning leadership in battle. He changed the manner of fighting to take advantage of surprise attacks on the enemy’s flank and focused on killing the enemy rather than just counting coup as had been the way of battles with Indian foes. Crazy Horse fought many battles did not get shot even though he routinely was in the thickest of the fight and always rode ahead of his warriors nearest to the enemy where the firing was the heaviest. His most famous battle was that of the Little Big Horn where Crazy Horse along with Sitting Bull and other chiefs were able to outflank Custer’s soldiers and kill them. On the day of the battle, as he often said when going into battle, Crazy Horse encouraged his warriors by shouting “Hoka Hey! It is a good time to die!” Yet, on this most furiously fought battle, he again did not receive a wound. But even so great a victory could not turn the tide of the ever-increasing number of soldiers being brought to fight Crazy Horse. While others surrendered, Sitting Bull and Crazy Horse continued to fight. Crazy Horse is said to have stated his strong ties to his people and the land he loved by the quote: “My lands are where my dead lie buried.” The battles were running skirmishes with the hard winter weather of as low as –30 degrees also hampering Crazy Horse and his followers as they could not make permanent camp. Although Crazy Horse did not likely know of it, the very land he was fighting to retain was actually signed away by Red Cloud and others even while he continued to fight for it. Ultimately Crazy Horse was forced to allow his followers to come in to Red Cloud Agency as food was unavailable and conditions were becoming unbearable for the women and children. He was promised much by the white soldiers that they never intended to deliver. The other chiefs became jealous of Crazy Horse’s standing and were afraid that the white government would make Crazy Horse chief of all the Sioux because of their fear of him. The soldiers were trying to convince Crazy Horse to go to Washington to see the President, but in fact were intending to send him to a prison off the cost of Florida. Crazy Horse was convinced to come to Fort Robinson to explain to Colonel Bradley that he did not intend to fight anymore. When he arrived, however, Bradley would not see him. Rather the soldiers attempted to lock him in a stockade cell. When Crazy Horse realized what was happening he attempted to get away from those restraining him. His friend, Little Big Man, had a hold on his arms and just as Crazy Horse’s vision had shown him some twenty-three years earlier while he was being held by one of his own people his life was taken from him. A soldier plunged a bayonet into his side puncturing both kidneys. Crazy Horse realized immediately that death was inevitable. Touch-the-Clouds and Crazy Horse’s father, Worm - who had also been named Crazy Horse, stayed with him until he died just before midnight. The death of Crazy Horse marked the end of the struggle to retain the old ways and led to a resignation to reservation life that meant the end of a proud and noble people’s way of life. The man who was Crazy Horse and who followed his vision in battle and who saw the future of his people died an untimely death. He is remembered by his spirit and kindness to his people. A mountain in the Black Hills is being transformed into an image of his likeness. The spirit of Crazy Horse is even today a strong and abiding presence in all who know his history. He is larger than life and his influence is still felt by all who believe in the ultimate strength and goodness of the human race…regardless of the color of one’s skin. In addition to seeing the fall of his people in their struggle with the white invaders of their land, Crazy Horse also saw in his second vision a time when ultimately all people were one and were living together in peace. So the spirit of Crazy Horse who fought to hold on to the ways his people knew and understood also is a spirit that realized the inevitable conclusion of the struggle between peoples. He was a victim of his time, yet he saw beyond the limits of his physical life.